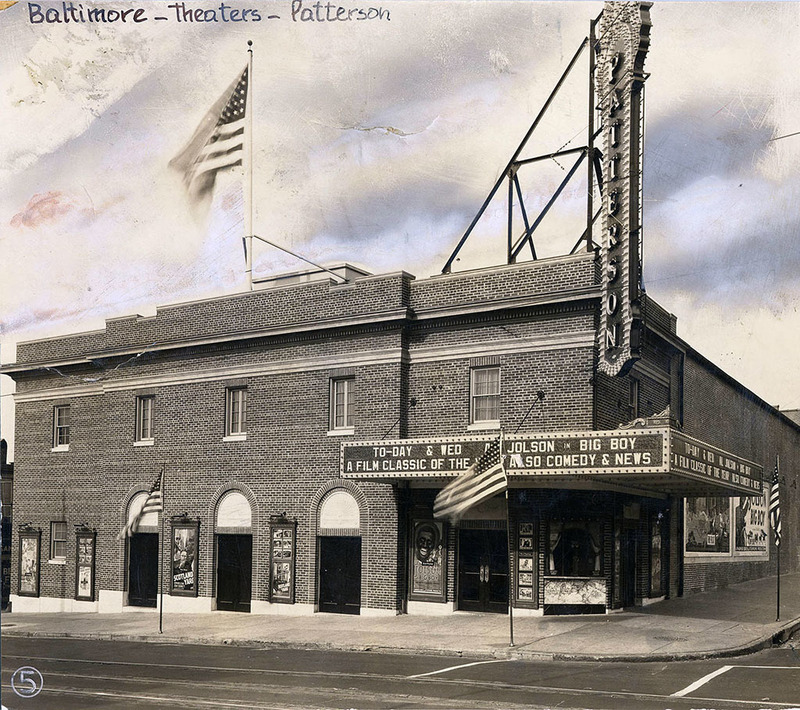 The first Patterson Theater to occupy 3136 Eastern Avenue opened in 1910. In 1918, Harry Reddish purchased the building to renovate and redecorate it. He reopened it two years later and renamed it the “New Patterson”. The Patterson Theater housed a large second floor dancehall with a wide stage and organ that could only be turned on by climbing under the stage. In 1929, the “New Patterson” closed. The next year saw a larger Patterson Theater, referred to as a playhouse, built in place of the old building. It opened September 26, 1930, showing Queen High with Charles Ruggles. Built by the Durkee Organization, John J. Zink designed the 85x150 ft building. He used a plain brick exterior (one of the plainest Zink ever designed). But the ornate, vertical sign appealed to the public. The interior color scheme consisted of red, orange, and gold with matching draperies and indirect lighting from crystal chandeliers. The theater’s low back chairs and spring-cushioned seats held between 900 to 1,500 people at a time. During its construction, designers took great care to ensure crisp acoustics for the showing of talking pictures. The Grand Theater Company, an affiliate of Durkee Enterprises, operated the Patterson Theater. In November 1958 an usher accidentally started a fire that caused considerable damage to the auditorium. By the spring of 1975 the owners twinned the theater into two 500 seat spaces, but the machinery remained untouched. In 1986, the old machinery proved deadly when a refrigeration company’s employee asphyxiated on Freon gas in the basement cooling system. The theater filled with firefighters who had to remove the maintenance man and set up large fans to push the colorless, odorless gas from the building. 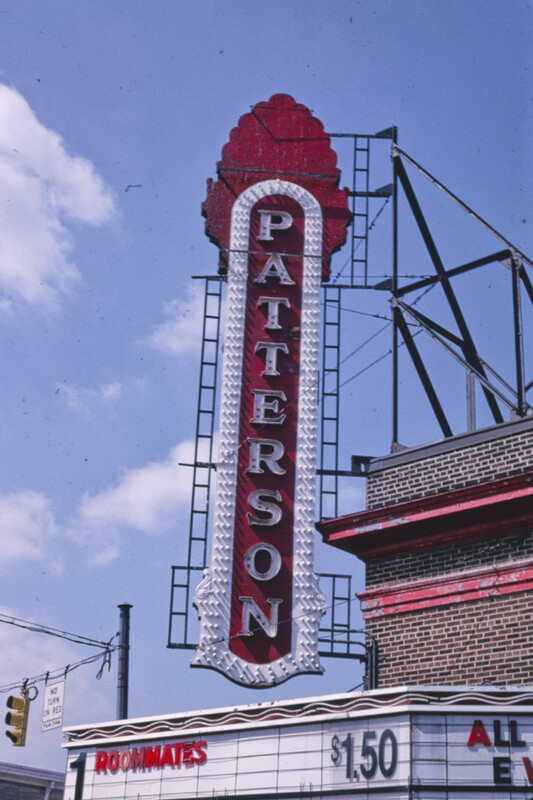 The Patterson Theater continued to operate until 1995, but by then the theater only showed discount films. It would be the last theater operated by the Durkee Organization. Creative Alliance, a community organization geared toward bringing audiences and artists together, undertook an extensive multi-million dollar renovation of the old Patterson Theater. Renovations began in 2000 when Cho Benn Holback & Associates gutted and rebuilt the building’s interior. Creative Alliance kept the fireproof concrete projection booth but turned the remainder of the space into a multi-purpose art center with galleries, artist studios, a marquee lounge and a flexible theater. While the historic vertical sign was one of the last originals in the city, extensive deterioration meant it could not be salvaged. Instead, Creative Alliance had it duplicated and replaced just before their reopening in May 2003. Since the opening of the new building, Creative Alliance has hosted hundreds of new events, including live performances, exhibitions, films and workshops. Sierra Hallmen, “The Patterson,” Explore Baltimore Heritage, accessed April 23, 2019, https://explore.baltimoreheritage.org/items/show/512.